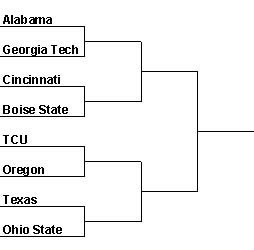 I realize I'm not breaking any new ground by suggesting that college football ought to have a playoff. I just don't understand how they have gone on for so long without one. I would set up an eight team playoff with the winners of the five major conferences getting an automatic bid: Big Ten, SEC, ACC, Big 12, and Pac 10. I'd give two other spots to winners of other conferences with preference given to undefeated teams. The final spot would be an at large bid. The conferences would be free to determine their champion by whichever means they choose. Under this system, the argument that a playoff would make regular season games less significant would hold no water. All late, significant regular season games are conference games so they would be extremely important in terms of who gets into the playoff and who doesn't. Early in the season, good teams would be more comfortable playing each other because those games don't count toward a conference championship. Teams would want to face good competition to tune up for the conference schedule. In a different year, with fewer undefeated teams, Florida would have gotten in as the at-large. Who wouldn't like that? Every first round game would feature an undefeated team and one of the games would have two. The season would end however, with at most one.